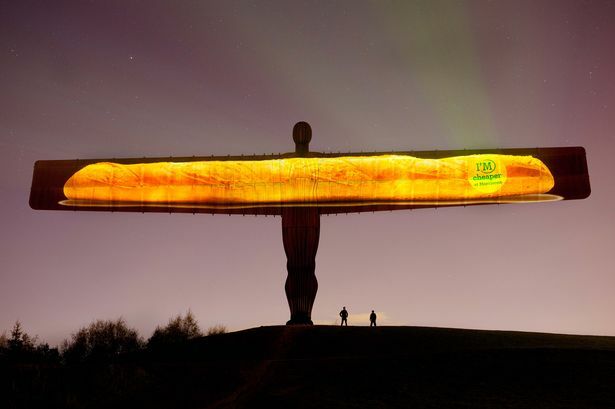 Supermarket chain Morrisons has been told to “use its loaf” after projecting an advert for cheap French bread onto the Angel of the North. The under-pressure supermarket tried to kick-start a price war over the weekend by projecting an image of a baguette on to the Angel’s wings. The move was criticised by artist Antony Gormley, who has always wanted the artwork to stand without any interference isolated and unlit. Mr Gormley had a clause added to the original agreement when work on the Angel began in 1994, refusing permission to light the Angel. “I’d rather the Angel is not used for such purposes, but it’s out there,” Mr Gormley said yesterday. And the chairman of Tyneside tourism group Newcastle Gateshead Initiative Paul Callaghan joined those on social media site Twitter hitting out at the advert. It is unclear if Morrisons had permission from Gateshead Council for the stunt. In 2011 Tourism Ireland fell foul of council rules when it tried to light the Angel green for St Patrick’s day. At the time the council revealed it had blocked the move as there was no permission for the projection or use of council land. Morrisons has recently had to slash prices amid concern it is losing out on its market share to Aldi and Lidl. But the company’s advertising stunt prompted outrage Twitter, with many criticising the supermarket for “cultural vandalism”. Morrisons has confirmed that the image was a projection and not a digital recreation. A spokesman added: “We’re sorry if you thought we got carried away by shining a baguette on the Angel of the North and apologise unreservedly to those to whom we have caused offence. Those views were shared by Gateshead MP Ian Mearns, who said the supermarket should have “used its loaf” before going ahead with the advert. Mr Mearns added that the commercial gain Morrisons were hoping for made it stand out from the light hearted moment in 1998 when a 30ft Shearer shirt was draped over the Angel. Back then Newcastle United fans won some praise after using a combination of a fishing line, rubber balls and catapults to hoist the replica on to the statue to mark a Wembley appearance. Gateshead Council did not respond to requests for a comment.